Your nails are carefully trimmed, shaped, and lightly buffed of any imperfections. Then your hands are to be polished with our hand made honey sugar scrub. Last your cuticles are softened and treated to a hydrating oil infused body butter, finished with a polish of your choice. From your elegant pink and white, or our individual custom color and glitter nails. We provide an abundance of nail art services for any occasion. 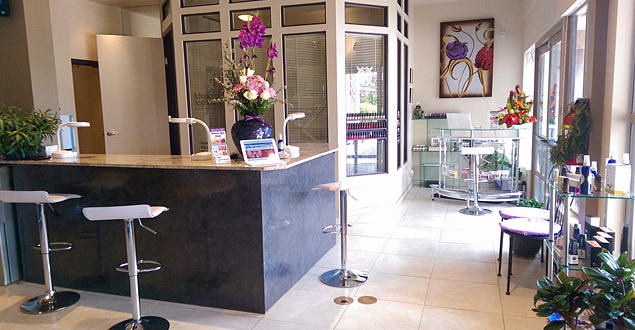 From plumeria flowers to 3D jeweled art our nail artists will provide you that special, unique, or abstract look. We use only top quality OPI products for use. Please feel free to call for specific pricing nail art services. Simple nail art is complimentary on every Tuesday! Join us in our state of the art beauty salon on Maui with 4 new, clean, pedicure stations, each with their own foot bath mini jacuzzi. Trimming of your nails, cuticles and calluses are carefully taken care of followed with a longer soothing foot and lower legs massage. Our licensed nail technicians begin by gently exfoliating of your feet and lower legs with our spa made mango sugar polish. A clay application to your legs sooths the skin and relaxes the muscles as they soak in hot towels. Finishing up with your choice of color polish and optional nail art. A Pedicure from Beauty Spa Maui will leave you feeling fresh, light and relaxed. Your feet will look and feel better. Bring your friends for a pedicure party or consider a pedicure gift certificate for the perfect gift from Beauty Spa Maui.